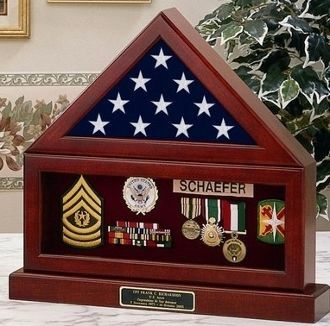 The flag and pedestal display cases is a A combination Flag Case and Shadow Box to allow for the display of a grouping with the flag. Each display case features beautiful Appalachian Hardwood with an elegant Queen Anne Cherry finish, sturdy masonite backing, and 1/8" glass front. A silk-screened, paper, flag front is included for display. Velcro-compatible material is included in the Shadow Box area. The depth between the glass and masonite is 2 3/8". That display case will fit : Houses a 3' x 5' flag. FB-275. Overall size: 19" W x 17 1/2" H x 3" D. Inside dimensions of the Shadow Box area: 17" W x 6" H. Houses a 3' x 5' flag. Wall-mountable only. Color choice of Velcro-compatible material: Black, Burgundy, Camel, Gray, Green, Oyster, Red, or Royal Blue. Also available with a solid wood base - FB-275-WB.